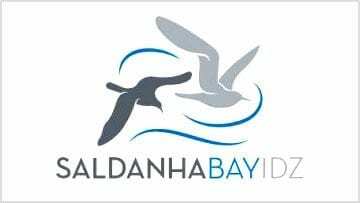 Saldanha Bay Municipality is a local municipality located on the West Coast of South Africa, approximately 140 kilometers north of Cape Town. 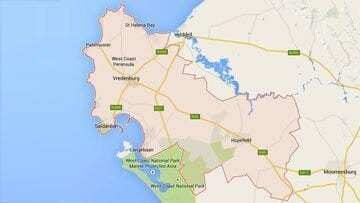 It forms part of the West Coast District Municipality, situated in the Western Cape Province. The municipality is bordered in the west by the Atlantic Ocean, in the north by the Bergrivier Municipality and the east by the Swartland Municipality. The Saldanha Bay area includes the towns of Langebaan, Saldanha, Jacobsbaai, Vredenburg, Paternoster, St Helena Bay and Hopefield. Residents of these coastal towns close to the port of Saldanha, have traditionally been employed in the fishing, agricultural and tourism industries. However, upskill learning programmes and artisan training in the industrial sector are promoting the increase of sustainable employment opportunities for the communities. The Business Chamber represents every kind of business including trades, retail and service businesses, resources, transport, accommodation, tourism and hospitality, industry and manufacturing as well as non-profit organizations. The economy of the West Coast region further stands to benefit from direct foreign investment worth about R9.3bn into the area over the next 25 years with the opening of the Saldanha Bay Industrial Development Zone (IDZ). The IDZ has the potential to significantly facilitate job creation and economic growth for the Western Cape. The IDZ will be a major catalyst for direct foreign investment and increased employment opportunities for West Coast residents in the medium to long term. Read more about the IDZ on the Wesgro website here. Saldanha Bay is the site of the country’s largest oil-storage facility and the sheltered harbour plays an important part in the huge Sishen-Saldanha iron-ore project. Saldanha has the largest natural port in Africa. With strong historic military links, Saldanha is also host to a Naval training base and the South African Military Academy. Vredenburg is the business and administrative centre of Saldanha Bay Municipality, Vredenburg offers essential services to surrounding smaller towns. Langebaan – With almost year-round sunny weather and safe water conditions, this is a world renowned mecca for kite surfers, wind surfers, kayakers, fishermen and yachtsmen. St. Helena Bay is one of the world’s principal fishing centres and its waters provide a valuable livelihood to many locals. The place where the sun rises and sets over the sea. Jacobsbaai is a beautiful isolated bay with a sea frontage of about 2 km. 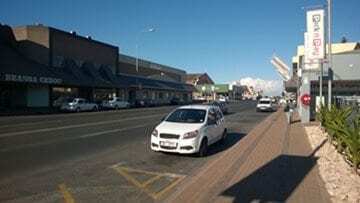 The housing development at Jacobsbaai is taking place according to strict architectural guidelines in an effort to create a typical West Coast town. Paternoster is very famous for the crayfish, perlemoen (abalone) and other seafood. Hopefield serves the grain, dairy, meat, honey and waterblommetjie farmers of the area. One of our primary goals is to advance the economic and socio-economic well-being of the Saldanha Municipal area of South Africa.